The Inklings was a group of friends who gathered around C. S. Lewis beginning in the late 1920's and continuing on until Lewis's death in 1963. Lewis's friendship with J. R. R. Tolkien formed the nucleus of this group. Other members came to include the novelist Charles Williams, C. S. Lewis's brother Warren, Hugo Dyson, Nevill Coghill, Christopher Tolkien and many others. The group met on Thursday nights in Lewis's rooms in Magdalen College, Oxford, to read to one another their works in progress. 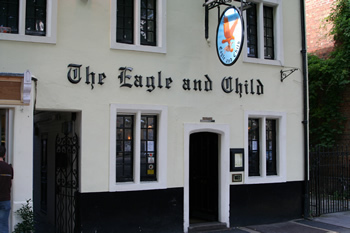 They also met on Tuesday mornings in the Rabbit Room of the Eagle and Child Pub in St. Giles. To read more about the Inklings I would suggest purchasing Diana Glyer's book, The Company They Keep.